just thongs! I was just imagining HOW HOT you must be feeling!! !I remember thinking the arvo was some kind of building! I know what you mean by the power of footwear.I like my sturdy leather hiking boots ,they make me feel strong and determined! When i taught drawing. 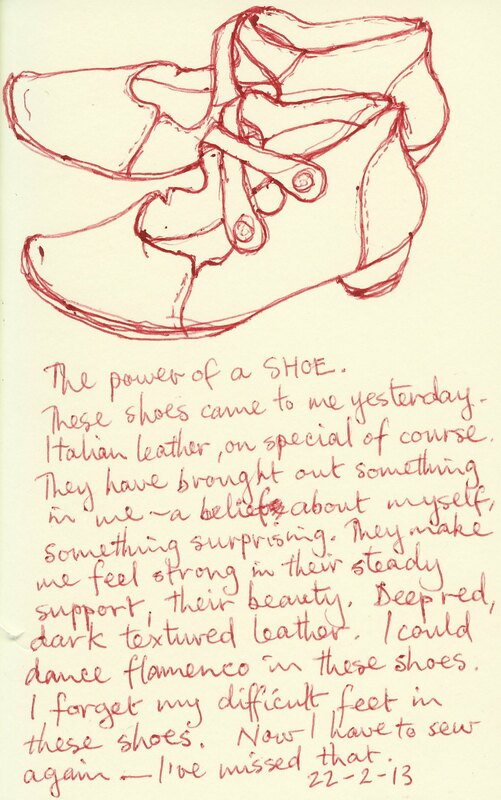 I always took in old boots for students to draw ,they express a lot of character of the wearer. Sometimes I asked them to take their own shoe off and draw. there’s hard permafrost outside today, so I dont need my wellies on to do the hens as its at least not wet! Hello Jos! How gorgeous to imagine you in your sturdy boots hiking up those Scottish hills! The opposites across the planet always surprise me too. Yes it’s been hot here this long summer. Rosie your new shoes are beautiful. And comfortable too – what a bonus. A lovely pair of shoes can lift one’s spirit no end! Hello Sharon! Great to hear your voice in my head. Yep, my love of shoes is back! Loved this story on shoes n bunions.